Can you believe we’ve already been here for almost 3 weeks? Orientation has been really intense, but it’s starting to wind down so I have some free time tonight to update the ol’ blogerewski. Tomorrow we will present our final practice lessons to Samoan students. I still don’t know what grade level I’ll be teaching, so I’ve tried to focus on mid-elementary material. My first solo lesson was yesterday. I taught a short (20 min) lesson on hyperbole. We couldn’t get any real elementary kids so instead we had a junior and a senior who graciously played the part of fourth-graders for me. The hyperbole lesson went well, but things got kind of weird today when I tried to introduce metaphor and simile to a 5th and 6th grader. The kids understood what I was saying but I just sort of lost track of my script and kinda-sorta forgot about the actual activity that I had prepared. Hopefully tomorrow will go a little better. The other day, our Field Director took us to Fagatale Bay to do some snorkeling. Fagatale Bay has been a National Marine Sanctuary since 1986; it was the 7th designated sanctuary and was the first outside of the mainland US. I was too chicken to go out past the breaks for the really good snorkeling, so I just swam around the mostly broken coral by beach. We are moving out of Nu’uuli VoTech on Saturday. From here, Wes & I are going to stay with some other volunteers at their new house in the village of Leone. WorldTeach orientation will be over on Friday, but we will spend next week at the Department of Education general assembly. I hope to meet with my principal soon, since she’s on island for the gen. assembly, and find out which grade I’ll be teaching. School starts on August 8th! I think that we’ll fly out to Manu’a on the 7th. 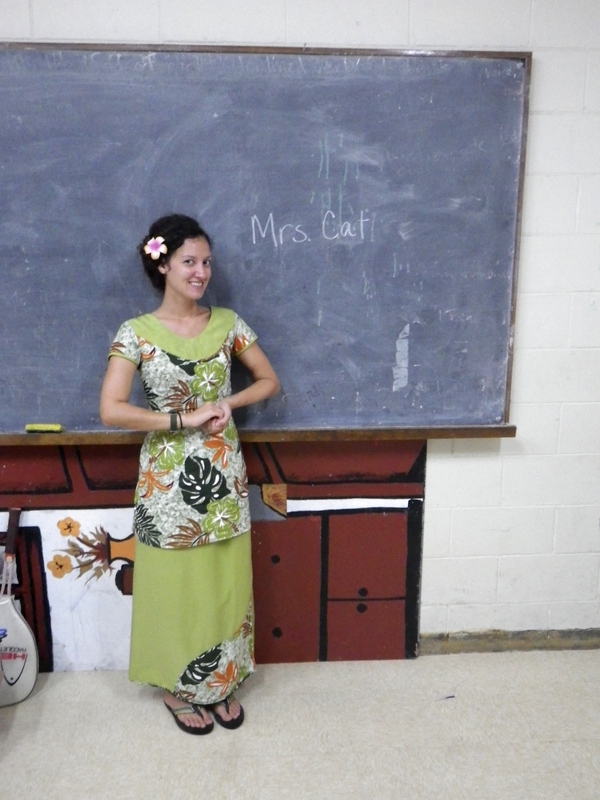 One or both of our principals will meet us at the airport in Fiti’uta and take us to our house in Faleasao. I can’t wait to get to our village and meet my students! Oh, speaking of airports and flying! Tonight is flight night! We are all going to the airport tonight to see one of our lovely field directors off. Flights come in/leave on Mondays and Thursdays and the whole world goes to the airport to greet the people coming in or say goodbye to the people leaving. The local TV station films it. It’s kind of a big deal. Don’t believe me? Check out Flight Night Samoa Maybe you’ll see me on tv!!! Also, check out Wes’s blog to see some more photos.photo page. This entry was posted in American Samoa and tagged America Samoa, Fagatale Bay, flight night, orientation, snorkeling, teaching, worldteach. Bookmark the permalink. 5 Responses to Flight Night!